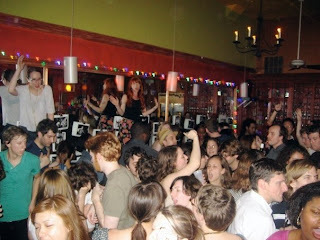 Finally, I got my chance to DJ at Soulelujah at ZuZu's over the weekend. I got a chance to drop some of my favorite soul tracks to a full dancefloor including Peanut Duck by Marsha Gee, Say Yeah Yeah by Yvonne Fair, and I Wanna Chance for Romance by Hector Rivera. Thanks again to Sean and PJ. See you back at the Highland Kitchen for Soul Shake this Saturday. You've probably already heard about Mayer Hawthorne but this is a nice little vid that gives you some info about his backgroud. Check out his modern version of the New Holiday's Maybe So Mayve No.